Identification: This species has a soft, gelatinous texture. In mature animals, the notum is covered with very small tubercles, arranged in clusters, with the central tubercle in each cluster slightly larger. The body is usually black when mature but juveniles are typically bright orange-red and intermediate animals often have a black margin and an orange-red submarginal band. Rarely, the orange-red band may be marginal rather than submarginal. (Note 1) Also, some animals have a blue to blue-gray marginal band. Occasionally, mature animals may be light brown with few or no darker blotches. The tubercles and rhinophores are usually tipped with white. The branchia are smaller, but more numerous, than in Dendrodoris fumata. 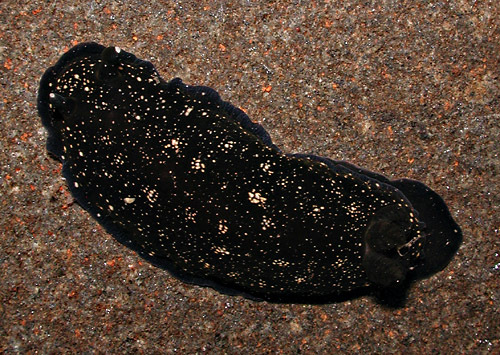 Natural history: Dendrodoris nigra is a common species found under rocks during the day or crawling in the open at night from the low intertidal to 5 m (16 ft). It occurs at moderately protected to moderately exposed rocky sites. We've found it associated with a fine-textured, peach-colored sponge and it may be eaten by the xanthid crab, Platypodia eydouxi. (Note 2) It lays a yellow, spiral egg mass and the eggs hatch in about four days in the laboratory. Distribution: Big Island, Maui, Oahu, Kauai, French Frigate Shoals, Midway and Kure: widely distributed in the Indo-Pacific. Taxonomic notes: This species is referred to as the "black dendrodoris" in Hoover, 1998 & 2006. It was first reported from Hawaii in Pease, 1860 (as Hexabranchus nebulosa). The drawing labelled Fig. 96d in Edmondson, 1946 is this species and Doridopsis Macfarlandi Ostergaard, 1955 is a synonym. (Kay, 1979) It's listed as Cryptodoris sp. in Ostergaard, 1950. Photo: CP: 35 mm: Hekili Point, Maui; March 16, 2009. Note 1: In March, 2013 Daniel Jennings-Kam found an animal on the Big Island that had a marginal, rather than submarginal, orange-red band. (see photos). A marginal orange-red band is characteristic of the similar species, Dendrodoris arborescens. However, the form and color of the branchia, number of lamellae on the rhinophores and relatively slender profile suggest that it's probably a color form of D. nigra. Note 2: On March 29, 2009 a student reported finding a Platypodia eydouxi holding a D. nigra in its claw during a beach walk at Hekili Point, Maui. The animal was somewhat mangled supporting the observation. This suggests that the crab may prey on D. nigra.